Hydrologists involved in SFFS have contributed a paper for this years EGU. A joint paper with CEH Wallingford was accepted for the session on hydrology for decision-making: the value of forecasts, predictions, scenarios, outlooks and foresights. 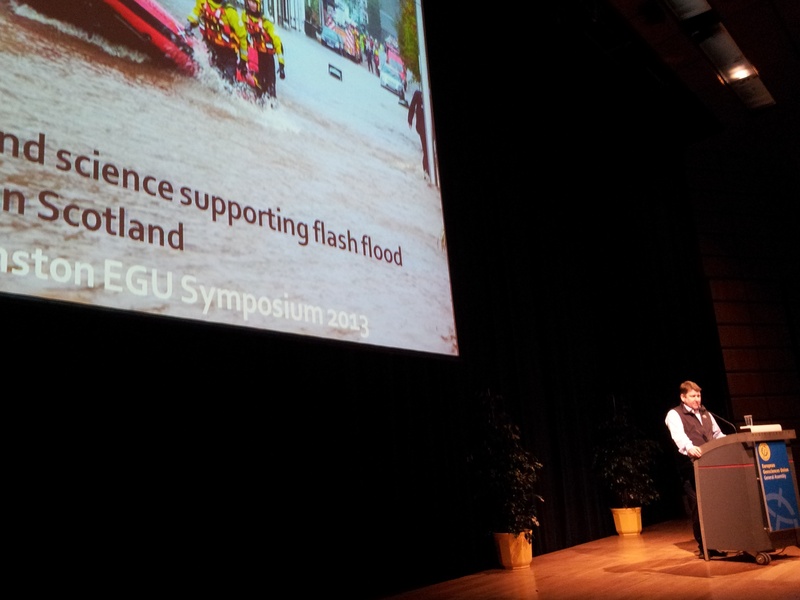 EGU presentation on the science and policy supporting flash flood forecasting in Scotland. The session included papers on varying types of predictions e.g. single valued forecasts, probability forecasts, the use of scenarios and outlooks, for different time scales (short-term, medium-term, long-term) and for different spatial scales (from local to regional to global). Our contribution focused on presenting scientific developments supporting the latest policy and challenges in flash flood forecasting. The abstract and more details on the session can be found on the General Assembly pages. This entry was posted in Conference, EGU, Flood, Forecasting. Bookmark the permalink.